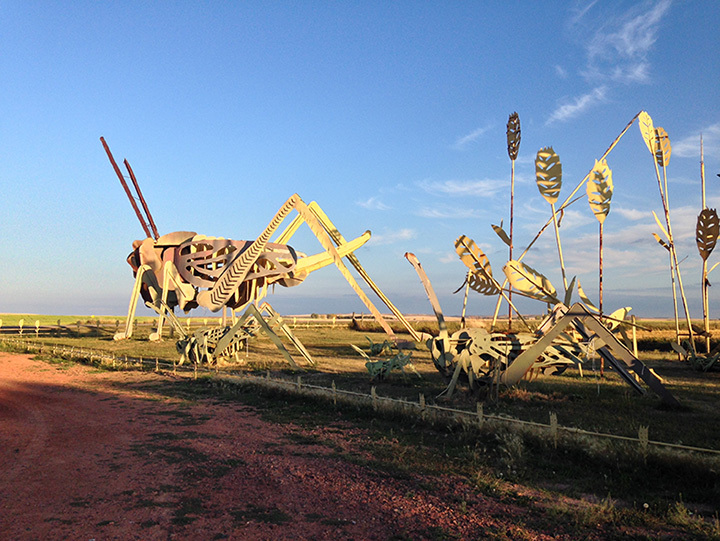 10 of the Best (and Most Offbeat) Attractions in North Dakota! Looking for the oldest still-intact missile launch control site? Or maybe an enormous turtle, cow, and buffalo? You can find all those oddities and more right here in North Dakota. If you’re a curious visitor or resident, you’ll be pleased to find an abundance of unusual attractions in the state. Here are the 10 best. In 1996, the Coen brothers put the city of Fargo on the map when they released the cult-hit “Fargo.” One of the movie’s most infamous scenes involves a wood chipper, which is now on display at the Fargo-Moorhead Visitor’s Center. Grab a fake leg, don a movie-style fur cap, and take advantage of a photo op like no other. Garrison is home to two of the state’s most unusual attractions. Big Gene is a 15-foot-tall zombie golfer made of sheet metal. He serves as the gatekeeper at the Garrison City golf course entrance. On the less creepy side, Wally Walleye, a 26-foot-long fiberglass structure can be found on the city’s Main Street, directly under Garrison’s claim as being the “Walleye Capital of the World. Located in North Dakota’s Turtle Mountains, Dunseith is home to W’eel, a giant turtle constructed from over 2,000 steel wheel rims. Created in 1982 by George Gottbreht, W’eel’s head alone weighs over a ton and bobs up and down on a pivot. The largest buffalo in the world resides in North Dakota. Located in the Pioneer Village and National Buffalo Museum, which also includes a herd of live bison, Dakota Thunder was created in 1959 by Elmer P. Peterson, who taught at nearby Jamestown College. Peterson built the buffalo out of concrete. It weighs 60 tons and is 26 feet tall and 46 feet long. What is now an empty pyramid shell, the space was once home to a large complex of military silos, a huge pyramid-shaped radar system, and an abundance of launching silos made to shoot down Russian missiles in the ‘60s. Due to the extraordinary expense of the system and concerns over its effectiveness, the program was shut down. It was operational for only three days. The Ringling Brothers Circus visited Wahpeton in June 1897. Despite a serious storm moving toward the area, workers set up their tent. The tent pole became a lightning rod, when three men were killed and another three injured when lightning struck. In September 1897, a granite monument was put up, sculpted to represent the remains of the original tent pole. The rope-and-pulley system the workers used to set it up is carved into the side, as well as a few jagged lines to illustrate where the lightning struck. This site holds the remaining remnants of the 321st Missile Wing, which is a gathering of intercontinental ballistic missile launch sites spread across 6,500 square-miles near the Grand Forks Air Force Base. This area played a pivotal role in the Cold War in North Dakota, and across the globe. The site is the last launch control center still intact. Few people know that the geographical center of North America lies in North Dakota, but Rugby is proud to hold that honor. The spot is marked by a 15-foot rock obelisk, which is flanked by poles flying the United States and Canadian flag.